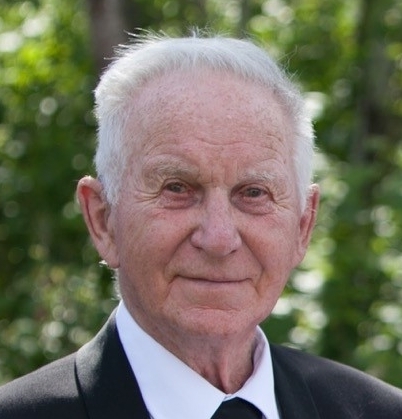 After giving his heart and soul to his family, church, and community for 91 strong years, Howard Balon passed away peacefully in Regina, SK on Monday, April 9, 2018 surrounded by his loving family, not far from his birthplace of Elm Springs. Howard, beloved husband of Muriel Horn for 67 years, gave life and love to their seven children: Devona (Lionel), Janet (Bob), Darlene (Andre), Myron (Wendy), Dianne and Arvelle (Bruce); 14 grandchildren: Myrina (Rabin), Kristin (Greg), Tricia (Matt), Lisa (Pat), Curtis (Erin), Jennifer (Jeff), Kent (Natalie), Casey (Jeremy), Jeffrey, Landon, Jalene (Matt), Lindsay (Blake), Cianna (Simon) and Shaelynn (Colton); and 16 great-grandchildren: Ella, Amelia, Corbin, Mathew, Nathan, Amy, Marcus, Zoé, Kami, Brenna, Ashlyn, Sadie, Elle, Carsen, Parks and Andy June. Howard is also survived by his sister, Olivia (Dean) Sane; and many loving nieces and nephews. He was predeceased by his parents, John and Eugenia; a brother, Peter (Audrey); and a daughter, Alva. Howard was a loving family man who lived a long and incredibly accomplished life. He attended the University of Saskatchewan in Saskatoon to study agriculture before marrying Muriel in October of 1951. They moved to Whitewood in 1959, together starting the legacy of their family farm and many years of community service. Howard ran a successful cattle and crop farm until they left in 1979 and moved into Whitewood where they lived until 2017. Howard took great pride in the family farming operations and stayed involved for nearly another 35 years. Howard was a dedicated member of the Knights of Columbus, first joining in 1950. He served as a Knight for over 67 years and was a fourth degree member for nearly 60. He was the first Grand Knight of the Whitewood – St. Hubert Council #6362. In 2016 in Moosomin, the Saskatchewan Knights of Columbus named a class of fourth degree members in honour of him. He was granted Sir Knight designation in 2017 for his dedicated years of service. Outside of his service as a Sir Knight, Howard was very active in his community. He served on countless boards and committees including the Saskatchewan Wheat Pool (50 years), Whitewood School Board, Saskatchewan Hospital Board & Health Care Association, board of the Moosomin Air Cadets, Camp O’Neill board, the Whitewood School Band Association, and a member of the Whitewood Seniors Community Band. He was a founding member of the Whitewood Credit Union, helped build the Whitewood Vet Clinic, and served as councillor for the RM of Willowdale for 12 years. Howard was a dedicated parishioner of St. Joseph’s Roman Catholic Church, serving on the board of directors, and as a reader in the Whitewood and Esterhazy churches. After retiring from the farm, Howard took up a position with the housing corporation in Esterhazy. What was meant to be a winter project turned into a decade of work he thoroughly enjoyed, arranging functions for elderly residents such as card parties and birthday celebrations. Howard and Muriel bought a lot at Round Lake in 1950, which would become the site of many memorable family summers over the next 61 years. Howard built the cabin from the ground up, adding to it over the years as the grandchildren multiplied. Howard had a contagious zest for life that only seemed to grow as he aged. He loved to fish, take out his boat, play cribbage and cards, play music, and much to the delight of his grandkids, let anyone “squeeze the peep” out of him with a big hug. He was a great social dancer and a talented musician and played a big tuba. Howard remained sharp and witty until the end. He will be greatly missed by his wife, children, grandchildren, friends, family and community.